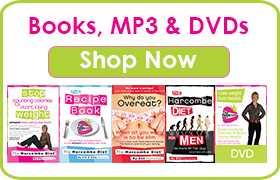 The Harcombe Diet® by Zoe Harcombe | Saturated Fat (not)! 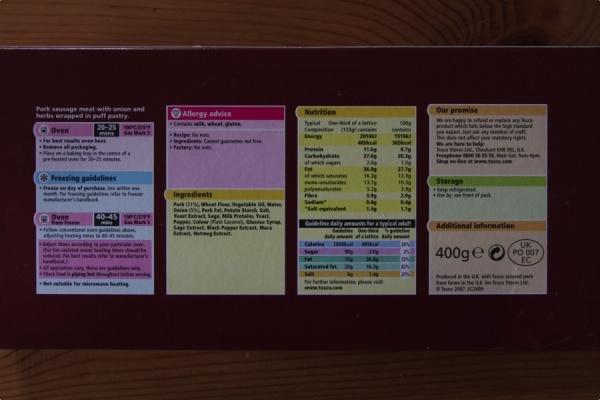 The items in bold are processed foods and should be avoided full stop. They are also primarily carbohydrates – not fats. Please see the fact sheet for full details. 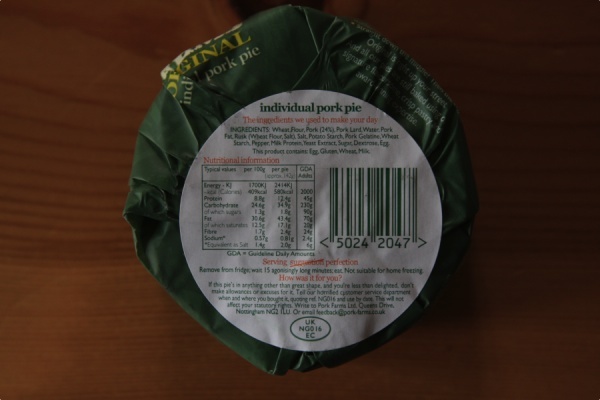 1) Fatty meats’ – please can the FSA and NHS explain what these are? In the fact sheet table you will be able to see that 100g of a ‘fatty’ pork chop has 21g of protein, 0g carb (of course) and 4.2g fat. Of this 4.2g of fat, 1.5g are saturated and 2.7g are UNsaturated. 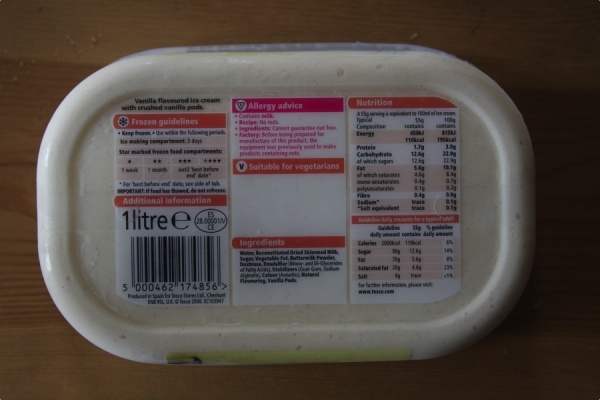 2) Dairy products – butter, cream, cheese etc – An area of compromise could be to eat meat without worry and to eat low-fat dairy products instead of the real versions (and, presumably to avoid cheese, as there is no decent low-fat alternative to this). However, dairy products contain the fat soluble vitamins, A, D, E and K and this means they need to be delivered in fat to be absorbed by the body. How sensible of nature to put fat soluble vitamins in fats and how stupid of humans to remove the fat and thereby the delivery mechanism. 3) Lard – this is pig fat – and, as with the rest of the pig (bacon, pork etc), lard is primarily UNsaturated fat! In fact, the main fat in lard is MONOUNsaturated fat – the substance that we should be eating more of according to our public health ‘experts’. 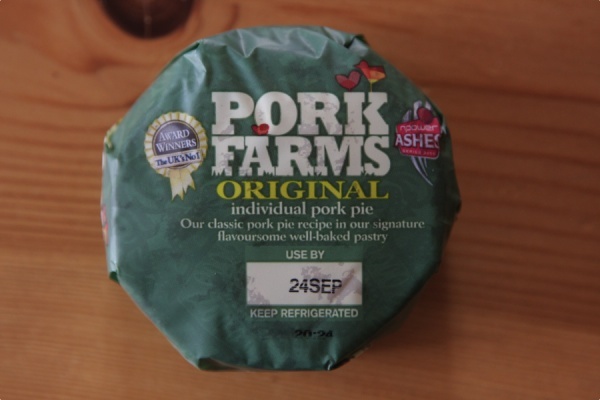 Pork pie (Pork Farm’s original) contains the following ingredients: wheat flour, pork (24%), pork lard, water, pork fat, rusk (wheat flour, salt), salt, potato starch, pork gelatine, wheat starch, pepper, milk protein, yeast extract, sugar, dextrose, egg. The pork and the egg will be the healthiest parts of this processed pie. 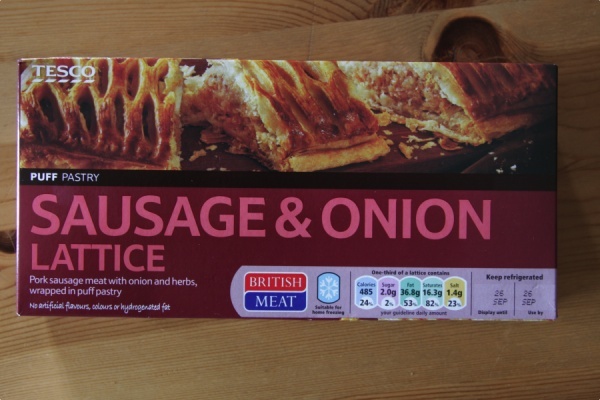 Tesco sausage & onion lattice contains the following ingredients: pork (31%), wheat flour, vegetable oil, water, onion (5%), pork fat, potato starch, salt, yeast extract, sage, milk proteins, yeast, pepper, colour (plain caramel), glucose syrup, sage extract, black pepper extract, mace extract, nutmeg extract. The pork and the onion will be the healthiest parts of this processed pie. 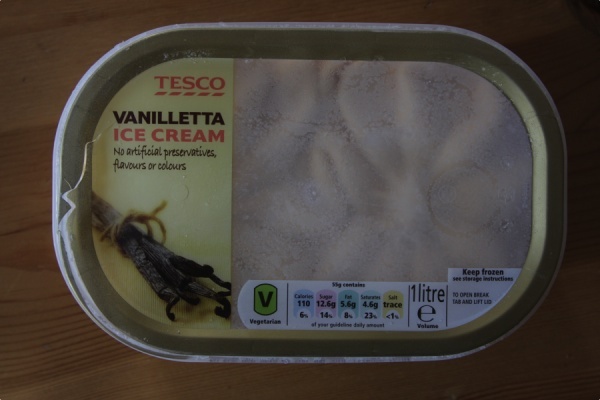 Tesco vanilla ice cream contains the following ingredients: Water, reconstituted dried skimmed milk, sugar, vegetable fat, buttermilk powder, dextrose, emulsifier (mono and di-glycerides of fatty acids), stabilisers (guar gum, sodium alginate), colour (annatto), natural flavouring, vanilla pods. This ice cream contains twice as much carbohydrate as fat – again the public health bodies are talking about carbs when they are accusing fat of heinous crimes. Sorry – we didn’t get a front picture of these Tesco chocolate éclairs before they went off! We obviously don’t eat any of this junk – we buy it, photograph it and then throw it away. 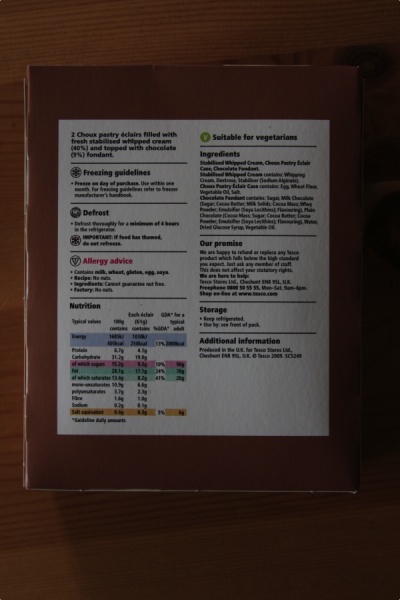 Chocolate fondant – sugar, milk chocolate (sugar, cocoa butter, milk solids, cocoa mass, whey powder, emulsifier (soya lecithin), flavouring), plain chocolate (cocoa mass, sugar, cocoa butter, cocoa powder, emulsifier (soya lecithin), flavouring), water, dried glucose syrup, vegetable oil). The cocoa powder, cocoa butter, water and egg will be OK! The rest is best in the dustbin. 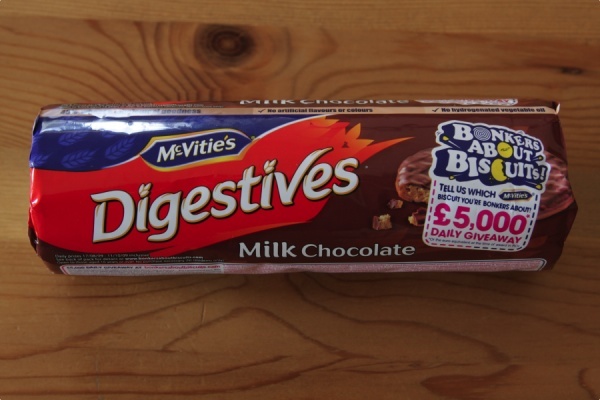 McVitie’s Milk Chocolate Digestives contain the following ingredients: Wheat flour (39%), milk chocolate (29%) [sugar, cocoa butter, cocoa mass, dried skimmed milk, dried whey, butter oil, vegetable fat, emulsifiers, (soya lecithin, E476), Natural vanilla flavouring], vegetable oil, wholemeal (9%), sugar, glucose-fructose syrup, raising agents (sodium bicarbonate, tartaric acid, malic acid), salt. 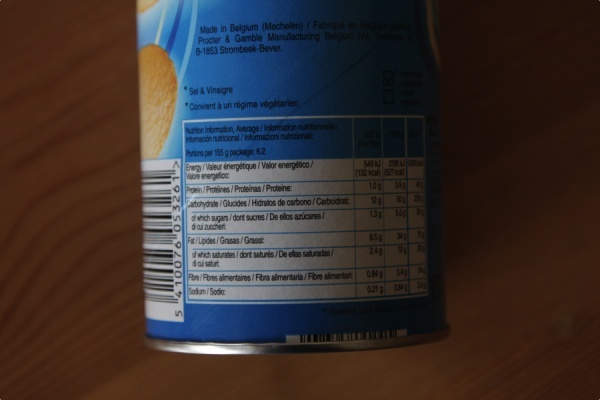 Interestingly – the biscuits are just about the only product where saturated fat is higher than UNsaturated fat on the product listing. 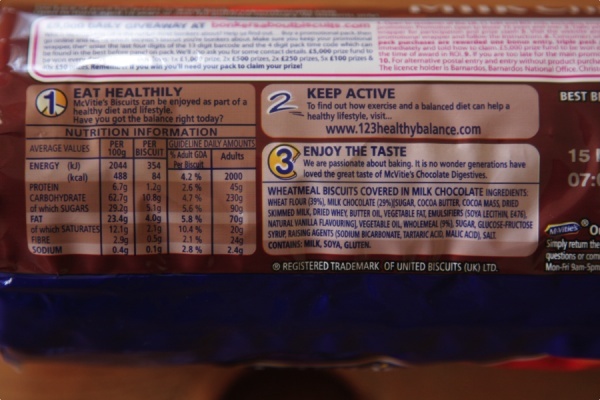 These biscuits have 12.1g of saturated fat per 100g and 11.3g of UNsaturated fat – still close! 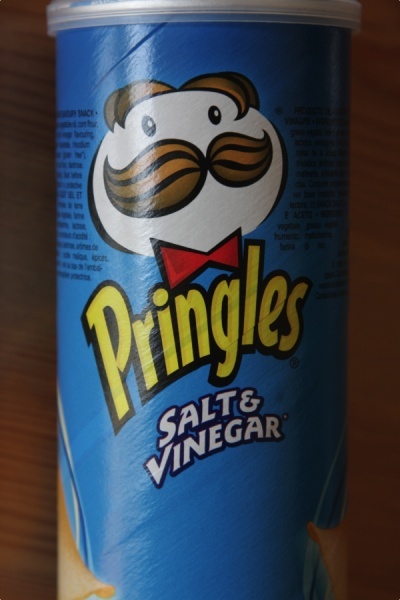 Pringles Salt & Vinegar contain the following ingredients: Dehydrated potatoes, vegetable oil, corn flour; salt and vinegar flavour (barely malt vinegar flavouring, lactose, acidity regulators, sodium diacetate, tridsodium citrate, malic acid), wheat starch, maltodextrin; emulsifier: E471, salt, rice flour, dextrose. Any followers of The Harcombe Diet will know – if you want crisps, you need just 2 ingredients – potatoes and vegetable oil (usually sunflower oil). This is the most basic ingredients list for Kettle Chips (and they are as good as crisps can taste). 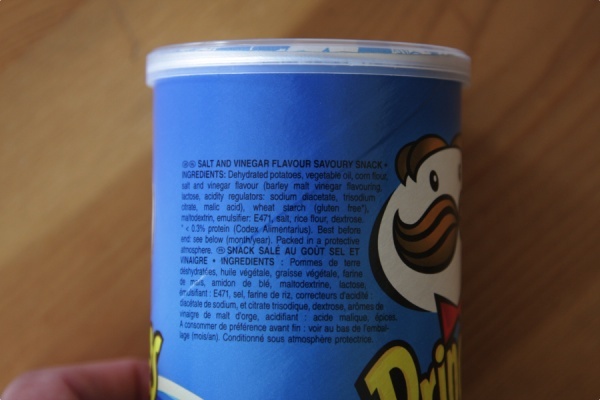 Supermarket own brands also now have potato and oil ingredients – nothing else added. 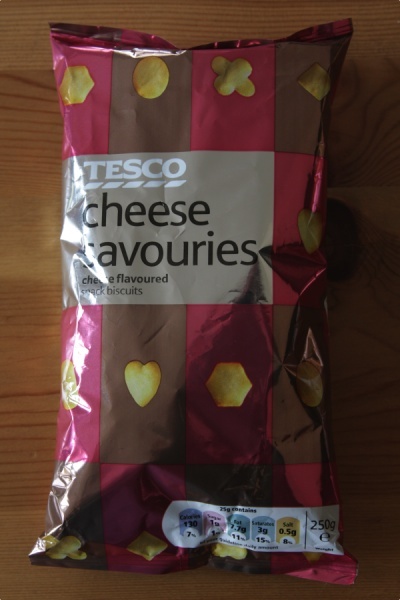 Tesco cheese savouries contain the following ingredients: wheat flour, vegetable oil, cheese powder (10%), sunflower oil, yeast autolysate, sugar, glucose syrup, malted barley extract, raising agents (ammonium bicarbonate sodium bicarbonate), salt, whey powder, lactic acid, natural flavouring, pepper, cayenne pepper. Did you know that, of the 30.8g of fat per 100g of this product, 12g is saturated and the rest is unsaturated? 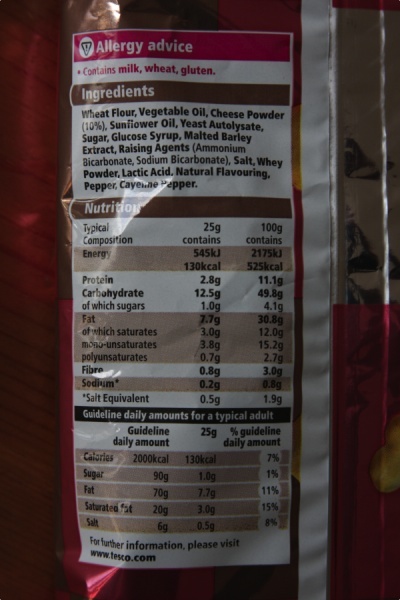 The main fat in this packet of junk is monounsaturated fat at 15.2g per 100g. Tesco chocolate chip chewy & crisp bars contain the following ingredients: Glucose syrup, oat flakes, crisped rice (which contains rice flour, wheat flour, sugar, malted wheat flour, malted barley flour, vegetable oil, emulsifier – soya lecithin, anti-caking agent – calcium carbonate), peanuts, dark chocolate (7%) (which contains cocoa mass, sugar, emulsifier – soya lecithin, cocoa butter), vegetable oil, cornflakes (which contain maize, sugar, salt, barley malt extract, emulsifier – mono and di-glycerides of fatty acids), sweetened condensed skimmed milk (which contains skimmed milk, sugar), sugar itself!, dextrose (which is another sugar), peanut paste, dark couverture chocolate (which contains cocoa mass, sugar, fat reduced cocoa powder, emulsifier – soya lecithin), glycerol, caramelised milk powder (which contains whey, butter, maltodextrin, sugar, skimmed milk) and anhydrous milk fat. 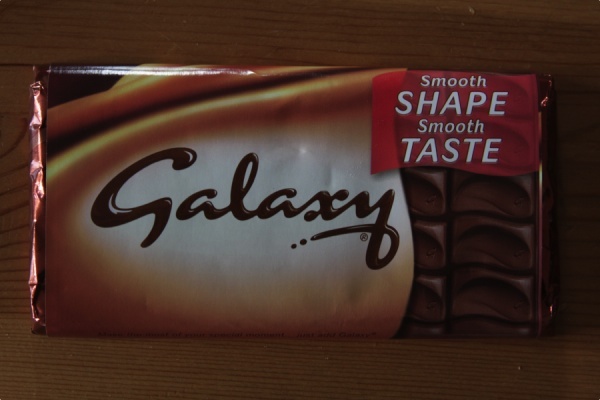 Galaxy milk chocolate contains the following ingredients: sugar, cocoa ingredients (cocoa butter, cocoa mass), skimmed milk powder, milk fat, lactose, whey powder, vegetable fat, emulsifiers (soy lecithin, E442), natural vanilla extract. 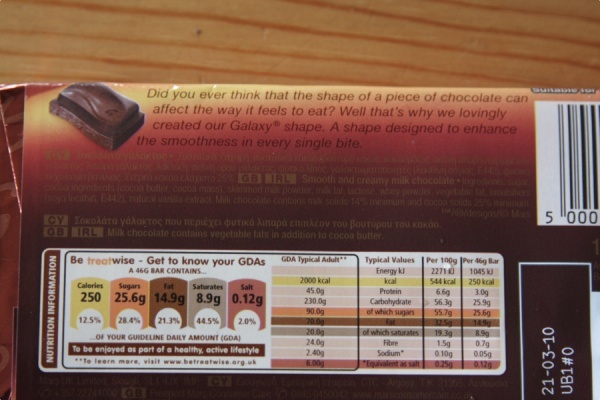 Why have this mass of sugar and milk when you can have 85% cocoa dark chocolate instead?! 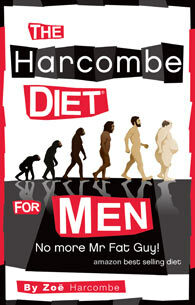 1) As always with The Harcombe Diet – nature knows best – eat food in the form that nature intends us to eat it, not how food manufacturers would like us to eat it. 2) If you don’t know what an ingredient is – don’t put it in your body. 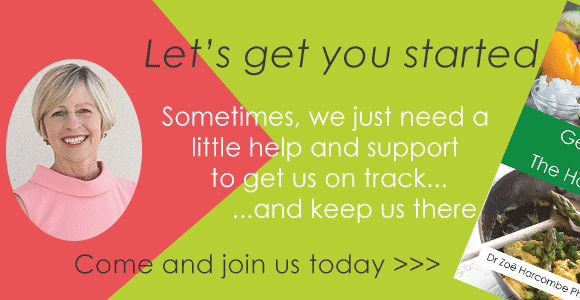 3) Our overriding public health message – for obesity, diabetes, heart disease, cancer and all ‘modern illness’ – should be “Eat real food”! Public health advisors need to be reminded of the difference between real and processed food and the macro nutrients carbs and fats and give this clear message accurately. At the moment, the FSA and NHS seem to be confusing their fats and their carbs.